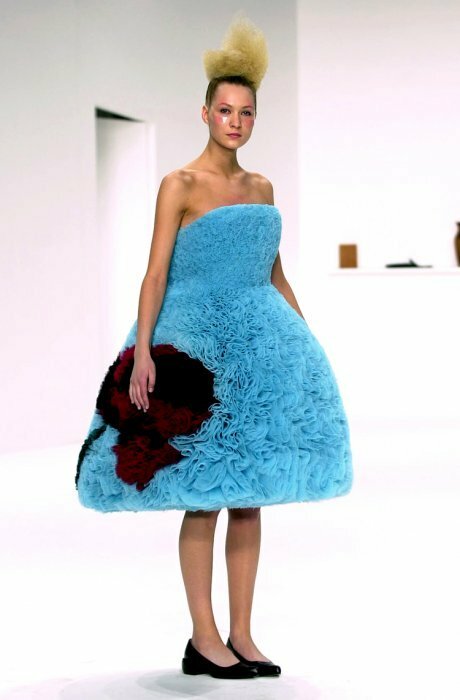 This week I decided to go over the the Musee Les Arts Decoratifs in Paris to check out the Hussein Chalayan exhibition. After waiting in a short line to get into the museum, I bought my ticket, climbed the stairs and opened the door into the exhibit. Walking into the space, I needed to take a moment to let my eyes get accustomed to the extremely low lighting. As I wandered into the exhibition, I saw glass boxes attached to the walls which housed the designs behind them. Personally, I was a little disappointed in the exhibit since all of the garments were behind glass with very little lighting, it was hard to really see the pieces properly. 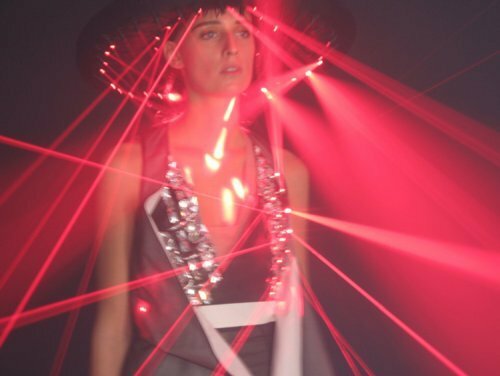 Of course, some of the pieces needed to be in the dark as the patterns were projected onto the white fabrics of the dresses, and some had laser beams shooting out of the designs. The dresses that didn’t need the dark should have been in a different space with more lighting! I am usually interested in seeing the textures and stitches in the fabrics, but there was no way I could get close enough to see them…. I should have brought a flashlight! Born in Nicosia in 1970, Hussein moved to London as a child. He earned his degree from Central Saint Martins College in 1993 and began to develop his distinctive style. 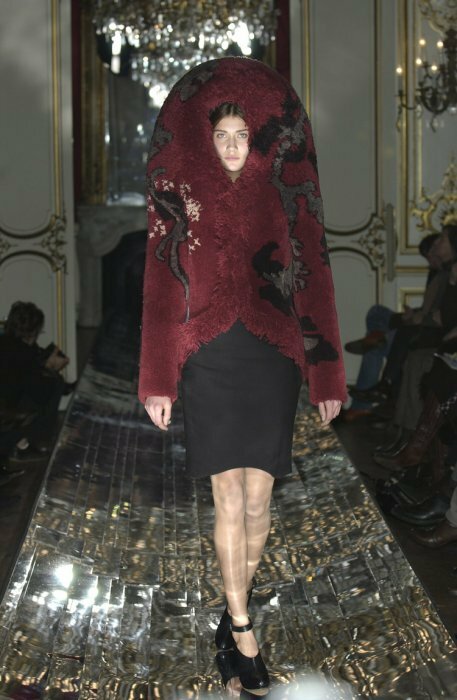 Chalayan stood out from the start of his career through his highly inventive uses of various mediums, including sculpture, furniture, video and special effects. He uses these processes in his fashion shows, drawing inspiration directly from the political, social and economic times of his era. 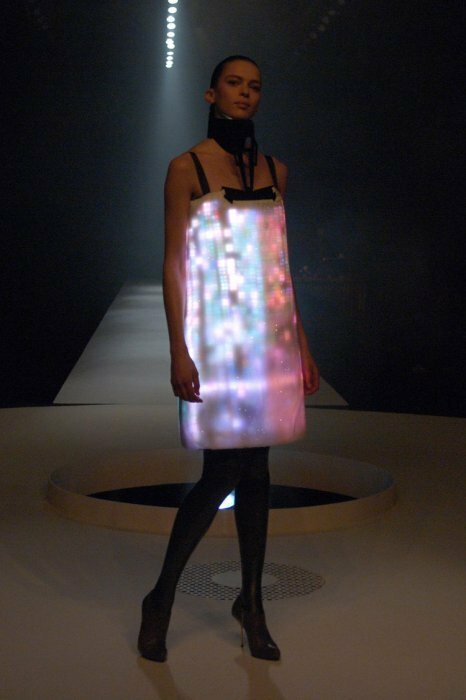 The Hussein Chalayan exhibit is on until November 13. There is more information on the Les Arts Decorativewebsite. I also went to that YSL exhibit! I loved it! I was so happy to see the Iris jacket that Lesage had done there! I had only previously seen pictures of it, and seeing it in person, it was even more stunning then I had thought!